The RCC-HD series cables are hybrid audio and video cables designed for remote broadcast, staging and production environments. Each video element is a CD7559 20AWG RG59 HD/SDI coax cable that is rated to 4.5GHz for high definition SMPTE 424M, 292M and 259M video data transmission. The audio elements are made from Clark’s SPA22GS low-loss 22AWG single-pair cables. Each audio and video element is uniquely color coded for quick identification. 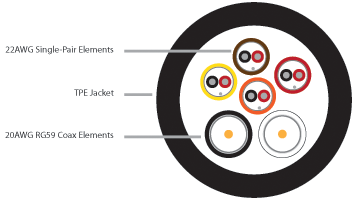 The outer jacket is an extra-flexible and abrasion resistant TPE compound. Gas-Injected Foam PE, .146" O.D. RCC1V2AHD 1 Black 2 Brown, Red .490" 130 lbs/Mft 4.9"
RCC1V3AHD 1 Black 3 Brown, Red, Orange .550" 150 lbs/Mft 5.5"
RCC2V3AHD 2 Black, White 3 Brown, Red, Orange .650" 210 lbs/Mft 6.5"
RCC2V4AHD 2 Black, White 4 Brown, Red, Orange, Yellow .675" 240 lbs/Mft 6.8"
RCC3V4AHD 3 Black, White, Grey 4 Brown, Red, Orange, Yellow .745" 285 lbs/Mft 7.5"
RCC3V6AHD 3 Black, White, Grey 6 Brown, Red, Orange, Yellow, Green, Blue .780" 325 lbs/Mft 7.8"
RCC4V4AHD 4 Black, White, Grey, Violet 4 Brown, Red, Orange, Yellow .815" 340 lbs/Mft 8.2"